The Wisconsin legislature sent a $72 billion biennial budget bill to Governor Walker's desk last week, giving him just four days to process and sign the budget before his July 13 scheduled presidential announcement. 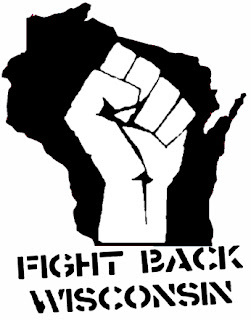 The bill slashes $250 million from the University of Wisconsin System, advances school vouchers and the corporate privatization of Wisconsin public schools, and is chock full of public policy provisions that did not have public hearings or public input. Although the governor has recently been projecting surpluses for the next fiscal year, the drastic cuts in state programs will still leave the state facing a structural deficit of some $490 million, according to the Wisconsin Budget Project. Last weekend, the Joint Finance budget-writing committee produced a large addition to the budget, an anonymous "999 motion" that took 24 pages just to summarize. Tucked into the motion were major changes to Wisconsin's open records law, a direct response to CMD's lawsuit against the governor over his efforts to axe "the search for truth" and the Wisconsin Idea from the budget. On Tuesday, Walker spokeswoman Laurel Patrick acknowledged for the first time that the governor's office played a role in developing the records proposal. While a public furor stopped these devastating changes, a number of other last-minute additions that will make life more difficult for Wisconsin's working families remain. Eliminates a long-standing provision in state law requiring the minimum wage to be a true "living wage;"
Allows payday lenders full reign to prey on low-wage workers by expanding the range of predatory loans and other products they offer and allowing them to give financial advice. After a month of public silence amid apparent intra-party gridlock, state Republican leaders used the quiet news period around Independence Day weekend to add several new "budget" items that pander to low-road employers wanting lower wages and fewer worker protections. One new provision rewrites the state's 100-year old minimum wage law that requires employers to pay a "living wage… sufficient to enable the employee… to maintain himself or herself under conditions consistent with… reasonable comfort, reasonable physical well-being, decency, and moral well-being" (though current state administrative regulations now interpret "reasonable" as "minimum"). Existing law both allows and requires state workforce experts to determine if the current minimum wage is appropriate. Past governors have used the law to raise the state's minimum wage when the legislature has refused to act. Last fall, 100 minimum wage workers submitted evidence to the state that the current $7.25 minimum wage failed the living wage test. In response, the governor's workforce agency responded with the preposterous claim that it "found no reasonable cause to believe that the wages paid to the complainants are not a living wage." Under the rewrite, the requirement that the minimum wage be a living wage will disappear. According to Jennifer Epps-Addison of Wisconsin Jobs Now, which helped the workers make their case, "Scott Walker would rather force working people to use food stamps instead of just making sure they're paid decently. It doesn't make any sense until you remember that he's working for corporate lobbyists, not the people." Another last-minute addition revives a failed 2014 proposal originally crafted "on behalf of" Wisconsin Manufacturers & Commerce that "allows" workers to "volunteer" to give up the one day off in seven that current state law requires certain employers to maintain. Workforce advocates are rightly concerned that such decisions, particularly when workers are not protected by a union contract, will not be entirely voluntary. It’s hard to improve the economy and grow wages when your economic program revolves around cutting them. Walker famously cut the wages of 320,000 public-sector workers by about 8 percent in 2011, and has ensured only minimal increases below the rate of inflation since then. Other "reforms"--including his ALEC-modeled 2015 "right to work" bill--will not only crush wages for the state's 180,000 private sector union workers but will also put downward pressure on wages and benefits for all workers in the state. Not surprisingly, Wisconsin ranks 42nd in federal wage growth, again the lowest in the Midwest. Now the wages of 116,000 construction workers are under attack. Republicans in the legislature had tried to repeal prevailing wage through stand-alone legislation earlier this year with fake studies and misleading spin, but could not get it passed until the Koch-funded Americans for Prosperity turned up the heat with a radio ad blitztargeting Republicans who had their doubts. The proposed changes will repeal prevailing wage requirements for all municipal, school district, and local sewerage district projects and remove the determination of prevailing wages for remaining state projects from the state agency that currently administers the program. Two Republican state senators and all the Democrats opposed the changes, but every other Senate Republican toed the anti-union line and the amendment passed 17-16. Democratic State Sen. Kathleen Vinehout told Wisconsin Public Radio, "We have a serious wage problem in this state while across the border in Minnesota the economy and wages are going gang-busters. These policies are just not working." The 999 motion also included a grab bag of corporate favors. It weakens the state's lead paint standard. It prohibits any town or county from demanding more insurance from pipeline companies to cover possible spills, barring Dane County from requiring Enbridge to increase its general liability insurance for a massive expansion of its Wisconsin pipeline. The Canadian firm wants to triple the flow of oil through its existing "Keystone alternative" pipeline and claims its $100 million insurance policy is adequate, even though its 2010 Kalamazoo spill has cost $1.2 billion to clean up. Another change will allow payday loan operators to expand into new product lines. Payday lenders have been slammed for exploiting the poor and "unbanked" with astronomical interest rates and fees. The 999 motion provides them broad new authority to sell additional financial products and services, including insurance and annuities, and "any financial or consumer finance service subject to regulation." Fred Nepple, former General Counsel for Wisconsin's Office of the Commissioner of Insurance explained to CMD that the payday lending proposal was a bad idea. "You don't sell annuities to people who are living paycheck to paycheck." "It is telling that payday lenders pushed for this in the dark hallways rather than in the light of public hearings. It deserves to be vetoed," said Nepple. Citizens did have two small budget-bill victories: not only were the open records law changes removed, but a sustained push-back from retirees preserved the governance structure of the state's retirement system oversight board, which oversees one of the best-funded and best managed pension systems in the nation. Walker will have a few days to review and sign the budget before his official entrance to the presidential race on Monday, July 13. Wisconsin governors have extraordinary powers to partially veto provisions so it is still possible that Walker may decide to change some previsions in the bill, especially if he wants to shed the label of a low-wage, low-road governor. > The article above was written by Jody Knauss and Mary Bottari, PR Watch/Report.